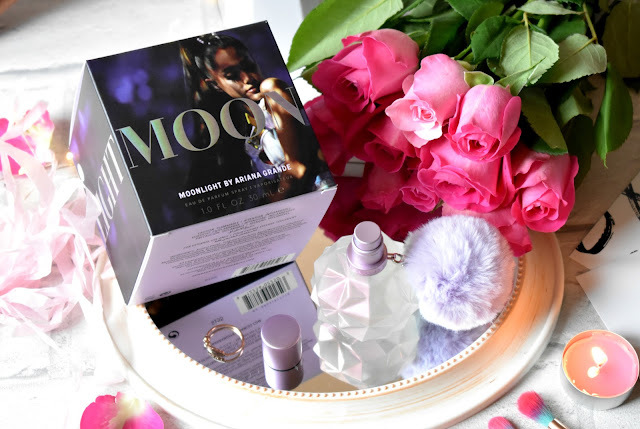 Is anybody else so over their warm, musky winter fragrances now, because I know I am, I'm ready for all things Spring, and today's post on Ariana Grande's Moonlight Perfume has got me feeling those Spring, fruity - floral vibes! I absolutely love Ariana Grande but I've never tried one of here fragrances yet until now, I guess I thought they might be quite young for me but after trying it I can confirm it's actually very universal! Moonlight by Ariana Grande* is a fruity, floral fragrance with splash of vanilla sweetness so it basically has a little bit of everything going on and I love it! It has top notes of blackcurrant and juicy plum for that fruity feel, heart notes of fluffy marshmallow and peony and the fragrance finishes off with base notes of sandalwood, amber and sensual vanilla! The notes in this fragrance all work amazingly well together, it's such a feminine scent without being too overpowering or young feeling and as I said before personally I think it's really universal! As for the lasting power - I felt the scent held up really well and I definitely always get whiffs of the fragrance on me all day long, I do go slightly mad when spraying perfumes on myself though, I'm one of those gals that has to spray perfume on my clothes as well as my neck and wrists, I feel like that always helps the longevity of a scent though, don't you? 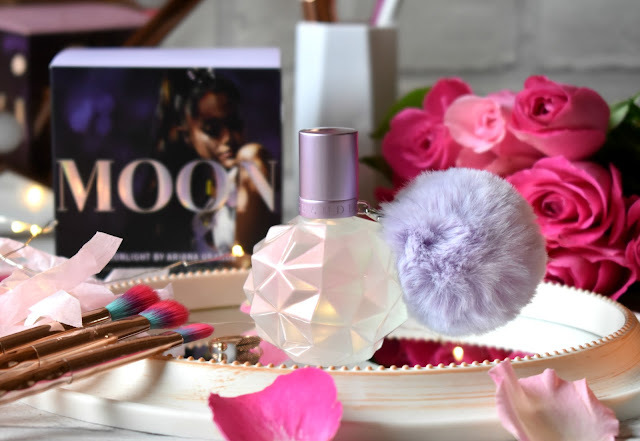 And finally can we just take a second to admire how beautiful the packaging is, the bottle itself has a jewel like look to it with an iridescent finish and lilac accents, and how cute it that pom pom detail, I'm pretty sure these little pom poms come on all of Ariana's fragrances and they can be removed so you can attach them to your handbag, makeup bag etc if you wish! If your after trying out a new perfume for the Spring time I cant recommend this one enough, and with Valentines coming up this could be the perfect gift too a loved one or to yourself he he! Moonlight is available in three sizes - 30ml, 50ml and 100ml and can be found from £22.45 on the Perfume Click website HERE.